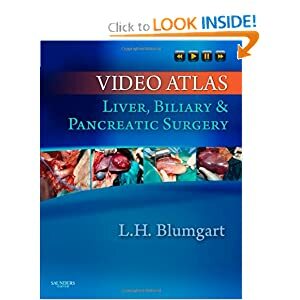 Video Atlas: Liver, Biliary and Pancreatic Surgery demonstrates advanced techniques used to train surgeons all over the world. Dr. Leslie H Blumgart has developed an extensive library of high-quality, narrated, and captioned videos that present history, radiologic evidence, and operative procedures-from major and minor resectional procedures to biliary and pancreatic anastomotic techniques. Dr. Carlos U. Corvera has worked with Dr. Blumgart to contribute laparoscopic alternatives to these innovative and landmark surgeries. On DVD, in print, and online at www.expertconsult.com, this multimedia resource provides detailed, practical instruction on this challenging area of surgery. Master difficult, complex, and lesser-known surgeries through more than 10 hours of high-quality procedural videos narrated by Dr. Leslie H. Blumgart-a pioneer in the field. See how an expert handles difficult cases from clear illustrations and step-by-step discussions of procedures, including Dr. Blumgart's personal techniques. Get coverage of major and minor resectional procedures, biliary tract and pancreatic resection, biliary and pancreatic anastomotic techniques, and more-including newly pioneered minimally invasive procedures from Dr. Carlos U. Corvera. "This is a must-have for anyone who practices hepatopancreaticobiliary surgery.